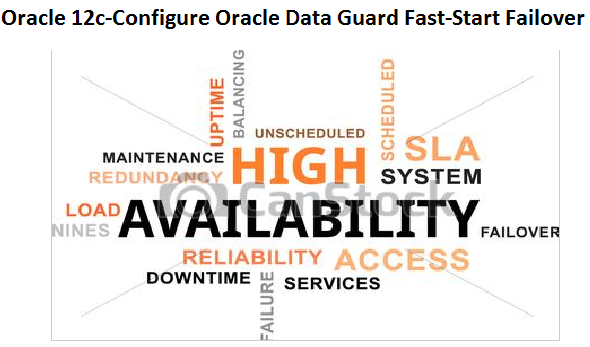 An Oracle Data Guard far sync instance is a remote Oracle Data Guard destination that accepts redo from the primary database and then ships that redo to other members of the Oracle Data Guard configuration. A far sync instance manages a control file, receives redo into standby redo logs (SRLs), and archives those SRLs to local archived redo logs, but that is where the similarity with standbys ends. A far sync instance does not have user data files, cannot be opened for access, cannot run redo apply, and can never function in the primary role or be converted to any type of standby database. Far sync instances are part of the Oracle Active Data Guard Far Sync feature, which requires an Oracle Active Data Guard license. 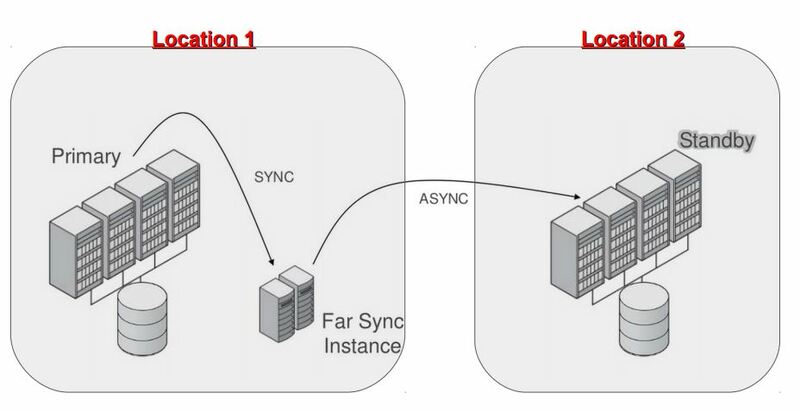 Creating a far sync instance close to the primary has the benefit of minimizing impact on commit response times to an acceptable threshold (due to the smaller network latency between primary and far sync instance) while allowing for higher data protection guarantees — if the primary were to fail, and assuming the far sync instance was synchronized at the time of the failure, the far sync instance and the terminal standby would coordinate a final redo shipment from the far sync instance to the standby to ship any redo not yet available to the standby and then perform a zero-data-loss failover. Service "oradbwr" has 1 instance(s). Service "oradbwr_DGMGRL" has 1 instance(s). Service "oradbwrf" has 1 instance(s). Service "oradbwrf_DGMGRL" has 1 instance(s). Service "oradbwrs" has 1 instance(s). Service "oradbwrs_DGMGRL" has 1 instance(s). standby database server, renaming it to orapworadbwrs. Configuration "chennai" created with primary database "oradbwr"
Successfully configured Far sync standby database. In the $ORACLE_HOME/database directory of the standby system, create an initialization parameter file named initORCL.ora with the below parameter. Primary: Standby: Now, check the current sequence of archive log in both primary & standby. SQL> archive log list From the above two snaps from primary & standby has the same archive log sequence applied. Now, switch a redo log in primary and check the alert log in standby. SQL> @taln.sql 20 Using the above script, we can see the alert log from sqlplus and from the above snap, the sequence 125 has been shipped from primary to standby. Shutdown Primary database and Listener. ApplySession: Optional component(s) [ oracle.oid.client, 12.1.0.2.0 ] , [ oracle.has.crs, 12.1.0.2.0 ] not present in the Oracle Home or a higher version is found. Composite patch 25755742 successfully applied. Step4:-Shutdown Primary database and Listener. We have already enabled the Fast Start Failover,now we are going to testing the Failover. To simulate a fast start failover,i will kill the smon proceess in primary database so that it looses the connectivity with the observer and the standby database. This feature increases the availability of the database by eliminating the need for DBA involvement as part of the failover process. The key to this feature is a monitoring process appropriately named the Observer. 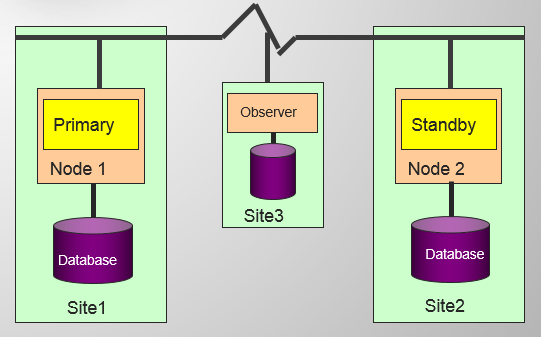 The Observer is a component of the DGMGRL interface that is configured on a system outside the systems actually running the Oracle Data Guard configuration, which monitors the availability of the primary database. 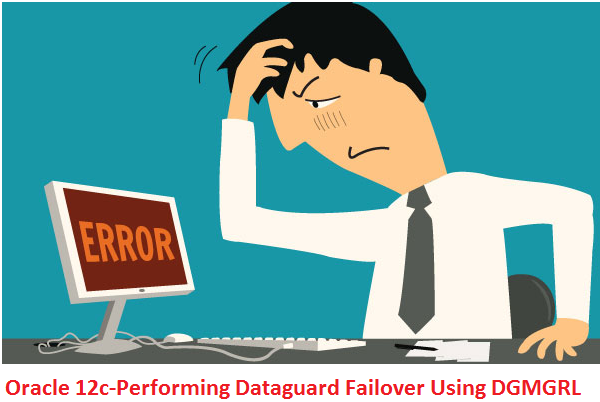 Datafile Offline Failover is initiated if a datafile on the primary database experiences an I/O error resulting in a datafile being taken offline. This option is enabled by default. Corrupted Dictionary Failover is initiated if corruption of a critical database object is found. This option is enabled by default. Corrupted Controlfile Enabled by default, the detection of controlfile corruption will result in immediate failover. Inaccessible Log File This parameter, disabled by default, allows for failover to be initiated in the event that LGWR is unable to write to a member of a log group. Stuck Archiver Failover is initiated should the archiver on the primary database become hung. The default setting of this parameter is disabled. Flashback Database must be enabled for both the primary and standby database target. 2. An observer server (server outside of the Oracle Data Guard configuration) should be established to monitor the environment. The observer is integrated in the DGMGRL client-side component of the broker and typically runs on a different computer from the primary or standby databases and from the computer where you manage the broker configuration. Idealy we need to configure the observer should be started on another host, to observe the primary, as if the host goes down it can monitor the outage and do specify actions. Introduced in 11g, snapshot standby allows the standby database to be opened in read-write mode. 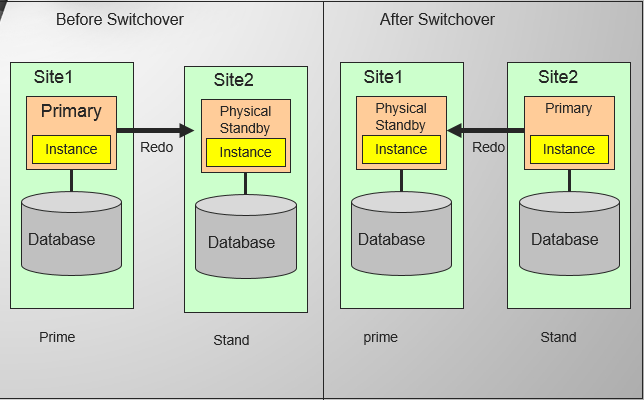 Oracle provides an unique feature where the physical standby database can be opened in READ WRITE mode to perform update able transactions. but a snapshot standby database can be used to perform both READ and WRITE activities. Most importantly, a snapshot standby database keeps receiving the redo data from the primary database but does not apply them. These redo data received from the primary database would be applied only when the snapshot standby database is converted back to the Physical standby mode. There by the snapshot standby database provides data protection on primary database. If your former primary database was configured with Flashback Database, you can easily reinstate the failed primary database as a standby database of the new primary database. The failed primary database will be reinstated as a standby type that matches the old standby database. For example, if you failed over to a physical standby database, the old primary will be reinstated as a physical standby database. Step1:-Restart the Old Primary Database. Step2:-Reinstate the old primary database. Step3:-Show the Configuration and Databases. We invoke a failover operation in response to an emergency situation, usually when the primary database cannot be accessed or is unavailable. 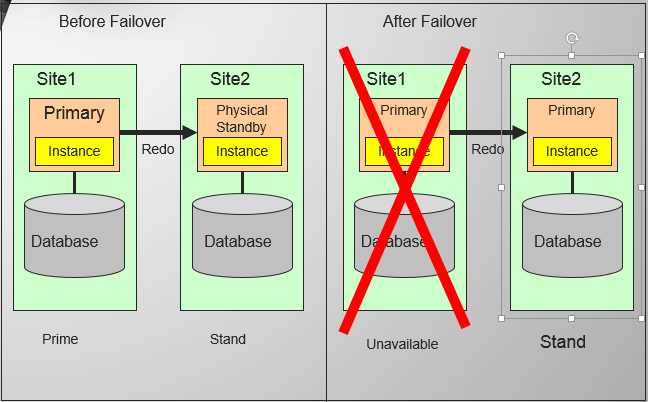 We need to enable the flashback database for both side.So that we will REINSTATE easily after failover. Step2:-Issue the SHOW CONFIGURATION command to verify the failover. Step3:-Check the readiness of the target standby. Now you can issue the failover command to make the target standby database the new primary database for the configuration. Standby redo log files are configured on the primary database. The broker configuration file is updated to reflect the change in roles. Restarts the new standby database and begins the redo apply service. The new primary database is opened in read/wirte mode and the redo transport service is started. an exhaustive set of checks on the database to confirm that it is ready for a role change. Data Guard broker is a centralized framework to manage entire Data Guard configuration through a client connection to any database in the configuration. DGMGRL does not have the ability to create standby (GUI can do it). CLI is used mostly for configuration and management. Broker keeps its configuration details in flat file. The files are stored at each database nodes in the Data Guard configuration.Additionally two copies of the configuration files are always stored on each database for redundancy. Below parameters control where the configuration files will be stored. Service “prime” has 1 instance(s). Service “prime_DGMGRL” has 1 instance(s). Service “stand” has 1 instance(s). Service “stand_DGMGRL” has 1 instance(s). Error: ORA-16698: LOG_ARCHIVE_DEST_n parameter set for object to be added Failed. Successfully configured the Dataguard Broker in 12c database.